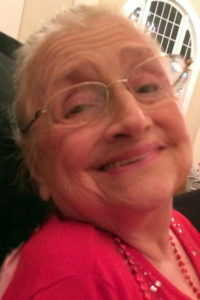 Angela E. Caruso, nee Fama, 74, died peacefully on January 11, 2017 surrounded by her loving family. Born in Brooklyn, NY, she moved to Staten Island and worked as an Executive Assistant for a moving company. Angela loved to host family and friends at warm celebrations in her home. She enjoyed traveling to Europe, cooking, and swimming at Brady’s Pond, which her home overlooked. Angela is survived by her loving husband, Joseph Caruso; loving daughters Lauren (James) Vaccaro and Heather (Stephen) Caruso Brown; dear sister Santa L. El-Dada; grandchildren Peter Joseph, Amanda James, Sophia Frances, and Stephen Angelo; and 2 nieces and a nephew. The Funeral Mass will be held at St. Sylvester Church in Emerson Hill at 9:30 a.m. followed by burial at St. Peter’s Cemetery. Friends are invited to call on Monday from 2 to 4 to 7 to 9 p.m. at Cherubini-McInerney Funeral Home, 1289 Forest Ave. (formerly Meislohn- Silvie).